Hogenakkal is a waterfall in South India on the Kaveri river in the Dharmapuri district of the Indian state of Tamil Nadu. It is located 180 km (110 mi) from Bangalore and 46 km (29 mi) from Dharmapuri. Sometimes referred to as the "Niagara Falls of India," it is known for bathing areas and hide boat rides, projecting itself as a major tourist attraction. Carbonatite rocks in this site are considered to be the oldest of its kind in South Asia and one of the oldest in the world. The Government of Tamil Nadu made a proposal to convert the falls into providing drinking water for the state. The word Hogenakal is formed of two Kannada words hoge and kal. When the water falls on the rocks it appears as if hoge (smoke) is emanating from the top of the kal (rock) because of the force of the water, hence Hogenakkal (smoking rocks). It is also called as Marikottayam by the people of Tamil Nadu. The Kaveri is considered to form at Talakaveri in the Brahmagiri hills in the Western Ghats of south India and gathers momentum as the land drops in elevation. It becomes larger as various tributaries feed into it on the way down. At Hogenakkal, the Kaveri, now a large river, drops and creates numerous waterfalls as the water cuts through the rocky terrain. In places the water falls as much as 20 m (66 ft) and is said to sound like continual thunder. Soon after the falls the river takes a southerly course and enters the Mettur Stanley Reservoir. The river carries sediment which makes the downriver land fertile. At Hogenakkal the river spreads out over a wide area of sandy beaches, then flows through to the Mettur Dam and creates a 60 sq mi (160 km2). lake called Stanley Reservoir. Built in 1934, this project improved irrigation and provided hydropower. The best season to visit is soon after the monsoons, when the river is in full spate. But some tourists prefer to visit during off-season to skip the crowd. The temperature in summer varies between 23–34 °C (73–93 °F) while during the winter it is still pleasant and ranges from 13–27 °C (55–81 °F). Boating in Hogenakkal is allowed during the dry-season as the water falls are not strong enough to disrupt the passage of the boats. This is the main source of income for these boat operators. The coracles are about 2.24 m (7 ft 4 in) in diameter, but still can take a load of eight persons at a time. These coracles are made of bamboo, and with all materials available takes about a day to build. The bottom of the boats are made waterproof by the use of hides, but sometimes with sheets of plastic. Use of plastics in the Hogenakkal vicinity, not just for boats, has been criticised due to problems with pollution. These boats are steered and propelled using a single paddle, making them unique. The coracles are locally called parisal in Tamil and either teppa or harigolu in Kannada. Freshly caught fish are sold by the gorge and also various vendors selling water and snacks up and down the gorge rowing their coracles is not uncommon. The fish caught include katla, robu, kendai, keluthi, valai, mirgal, aranjan and jilaby. After leaving the gorge, on the left shore one can find improvised stalls set up on the sand. There, one can let the fresh fishes be prepared in one of the many kitchens. Also, many people can be found swimming or bathing around there. 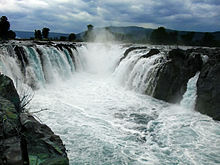 Hogenakal Falls is the location for the Hogenakkal Integrated Drinking Water Project proposed by the Tamil Nadu Government. The objective of this project is to provide safe drinking water to the urban and rural areas in Krishnagiri and Dharmapuri districts. In February 2008, The Japan Bank for International Cooperation agreed to fund the Rs 1,340-crore project. ^ Upon entering Tamil Nadu, the Kaveri continues through a series of twisted wild gorges until it reaches Hogenakal Falls and flows through a straight, narrow gorge.... "Kaveri River". Encyclopædia Britannica. Retrieved 6 March 2012. ^ "Taluk Information". Tnmaps.tn.nic.in. Retrieved 7 November 2008. ^ "National Portal of India : Know India : State and UTs". India.gov.in. Retrieved 7 November 2008. ^ Natarajana, M; Bhaskar Rao, B; Parthasarathy, R; Kumar, Anil; Gopalan, K (1994). "2.0 Ga old pyroxenite-carbonatite complex of Hogenakal, Tamil Nadu, South India". Precambrian Research. 65 (1–4): 167–81. doi:10.1016/0301-9268(94)90104-X. INIST:3910799. ^ "Dharmapuri district - places of interest". tamilnadutorism.org. Retrieved 11 November 2006. ^ "Cauvery River in Southern India". cauvery.com. Retrieved 11 November 2006. ^ "Overview - Visit India Travel Guide Hogenakkal Adventure". Hogenakkal.com. Archived from the original on 24 February 2014. Retrieved 7 February 2014. ^ Palmer, Colin; Blue, Lucy; McGrail, Sean (2001). "Hide Boats at Hogenakal on the River Kaveri, Tamil Nadu". South Asian Studies. 17 (1): 199–207. doi:10.1080/02666030.2001.9628601. INIST:13550447. Wikimedia Commons has media related to Hogenakkal Falls.